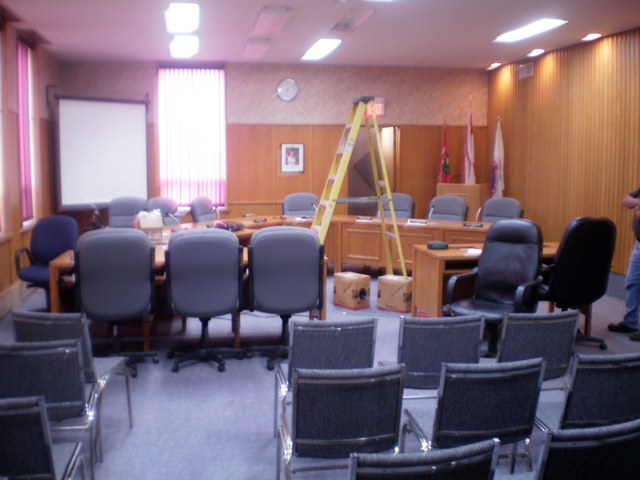 Arnprior’s Town Council Chambers are being rearranged. The configuration is more or less the same, giving the Mayor the centre of a “V” formation. But the “V” has been pivoted a bit. The Mayor will now be centred between the walls and be the focal point of the new formation. He or she will look directly at any citizens who might be in attendance from an obvious position of power. 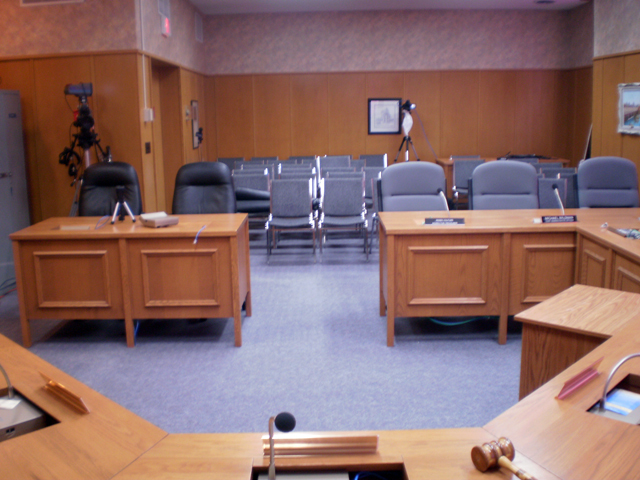 The town councillors will be fanning out from the Mayor’s position in two wings. 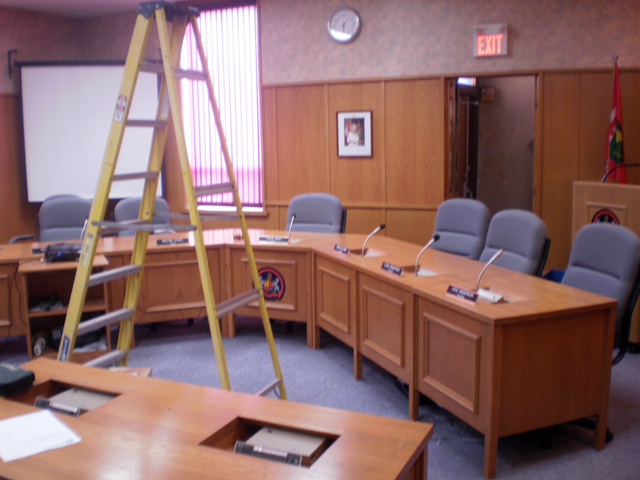 The assistant secretary, who does all the recording duties, will sit at an angle to the councillors and mayor and at a right angle to the rest of the staff. The assistant secretary will be facing the cameras. The Secretary, CAO, and Treasurer will sit pretty much sideways to the cameras and with their backs to any citizens who might be in attendance. 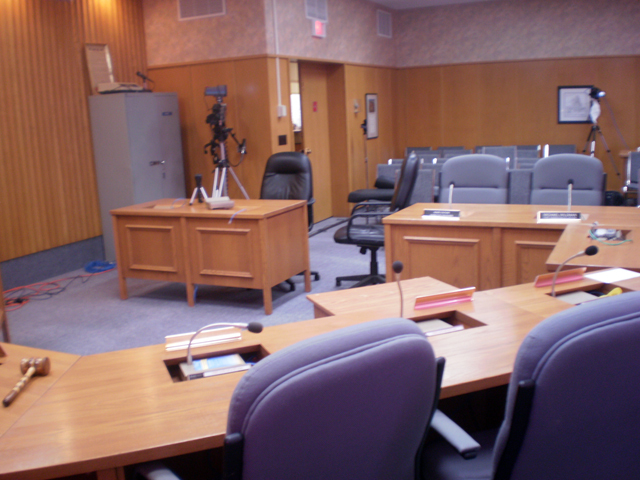 Anyone reporting to the town council or giving a presentation will sit at a desk to the right, also with their backs to any citizens in attendance. This desk has been more or less in this position for as long as I’ve been in town (ten years) but has been moved up and to the right to accommodate the Secretary, CAO and Treasurer’s desks, which have been pivoted into this new formation. The view from the back of the room. I suppose somebody thought this was a better way to line up the town councillors. 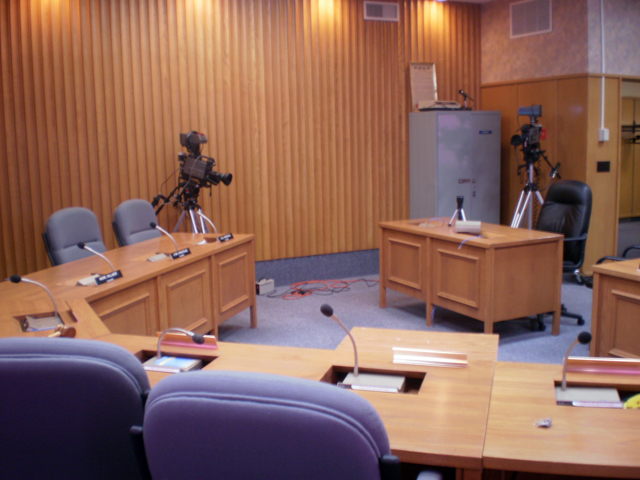 But it will present the Television Crew that covers town council meetings with a real problem. New Camera Placement. The CAO was quoted as saying that this should be a better arrangement than what was there before. Camera Two at the councillor’s elbow. No room for a camera person. This is the problem, the person operating this camera should not be between t he councillors and anybody else who wold be reporting. a camera person should be unobtrusive as he or she moves to focus on who ever might be speaking. This camera will be right in the face of anybody giving a report or presentation. 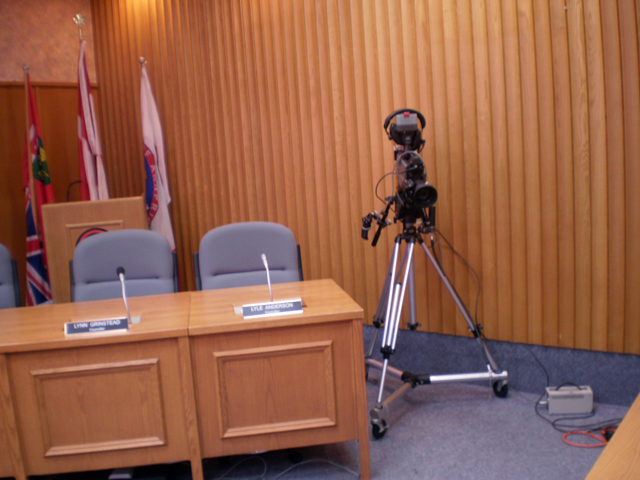 The tripods have wheels and if a camera person is behind the camera that camera will be a couple feet closer to the reports and presentations desk and if the camera person has beans for lunch he or she could drive the councillors to distraction. This is the Mayor’s eye view (Over the Mayor’s head actually) the wide angle camera in the back of the chambers has a white flag hanging from it. Camera One and the cabinet, left of centre. with the cabinet moved, a camera person will have about twelve to sixteen more inches to breath and move around behind the camera. Camera One, on the left will be a bit farther into the corner with the grey cabinet moved to the back of the room. When presented with the fact that this camera will get wonderful shots of the backs of heads of anyone at the reports and presentation desk, one town hall staff member said, “Well, they have taller tripods, don’t they?” Sure, a cheap used tripod goes for about $7,000. A more expensive tripod would be needed to get the necessary elevation to shoot over the heads of anyone sitting at the desk. Should we send the staff member a bill for that? This is the shot from Camera One’s position. Taken from about 6 feet above the floor. So anyway the staff member who was explaining their executive decisions to us looked at his watch, “So are we done here? You can work with this?” and left to go back to his office and close the door.